Hello! I hope you're having a great weekend! 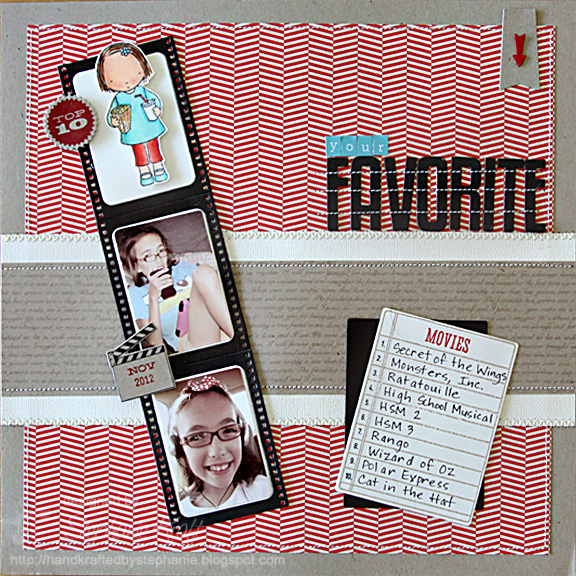 I have been working on this scrapbook layout off and on for the past few days. 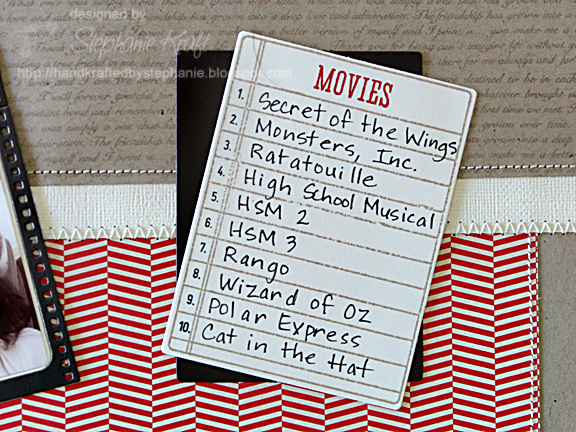 It documents Sabrina's top 10 favorite movies. She watches the same movie over and over for awhile, then she moves on to something else, but these 10 seem to recycle. Her current fave is the newest Tinker Bell movie, Secret of the Wings. 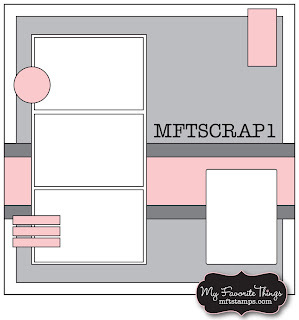 I used the scrapbook sketch from My Favorite Things, MFTSCRAP1. I started with a Kraft cardstock base layer. 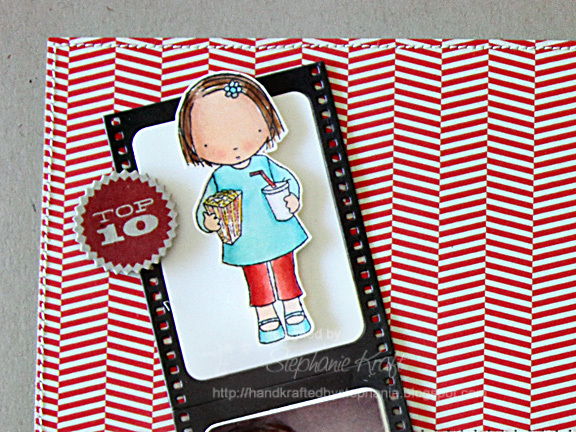 The red patterned paper is from the My Mind's Eye 12 Days of Christmas collection. I added a strip of cream cardstock and another Kraft layer over it. The text on the Kraft layer is from First Class Friend. My decorative elements on the top right were created with the LLD Accent It Tags and Flags Die-namics. 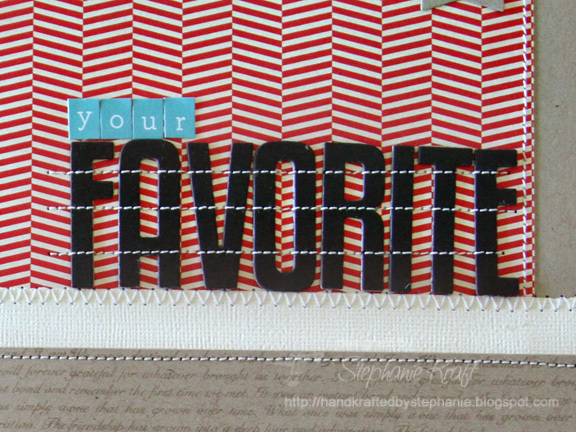 I used the High-Rise Alphabet Uppercase Die-namics to cut out Favorite a few times out of Hot Fudge cardstock, then I adhered each letter to itself (to create thicker letters). I added 3 layers of stitching across the letters. To create the list of movies, I used LLD Journal It - Top 10 and LLD Document It - December and the LLD Insert It - 3x4 Insert Die-namics. Finally, I added two typical photos of Sabrina while she is watching her movies. The first is with her iPad and iPhone (she likes to sync movies on both while she is watching them on the TV). When I got my new iPhone, she and Dan "inherited" it. She uses it for movies and to take photos, and he reads ebooks. The only problem is when they both want to use it at the same time. :) The second photo is her in the car, watching on the portable DVD player. 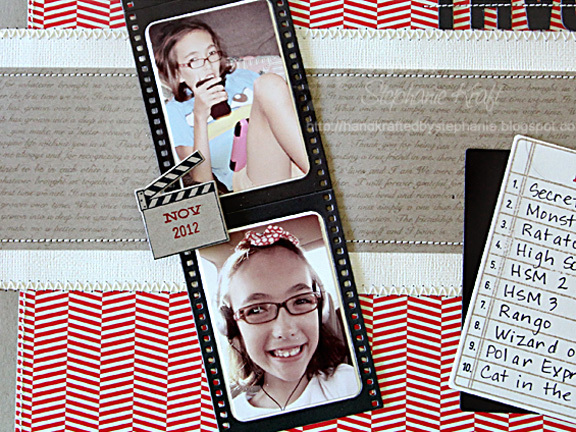 I added the movie directors clap board sign (stamp and Die-namics from At the Movies) and stamped the date using LLD Journal It - Calendar Basics and LLD Document It - Days and Dates. Stamps: First Class Friend, LLD Document It - December, LLD Journal It - Top 10, LLD Document It - Days and Dates, LLD Journal It - Calendar Basics, At the Movies, Pure Innocence - Popping By. LLD Insert It - 3x4 Insert, At the Movies (MFT); Markers (Copic), Letter Stickers (Simple Stories Sn@p), Foam tape, Thread, Sewing machine. What a FUN layout! Love how you angled the strip of photos and sewed down the title letters! This is SUPER CUTE, Steph! Love the pics of your daughter in the film strip! I love this page! Such a fun layout!! Such a great scrapbook page. I love how you added the PI girl into the page! Great job!